Panic attacks are sudden attacks of fear which might feel as though they appear out of the blue. Some people might just have a one-off panic attack and not experience any more. People who go on to develop panic disorder typically take steps to prevent the possibility of having another panic attack. During a stressful time in his life Ted experienced his first panic attack. He had been rushing to get some work done so that he could leave on time to visit his mother in hospital. He got stuck in traffic on the way to hospital and was worried that he wouldn’t make it on time. At the hospital he suddenly began to feel lightheaded and felt that he couldn’t breathe properly. Ted felt a wave of fear come over him, and noticed himself getting hot and sweaty. He left the hospital and smoked a cigarette in the car park to calm himself down. The sensations had only lasted a few minutes but to Ted it felt like forever. Ted experienced another few panic attacks over the next week. Each time they would come completely out of the blue and he would experience an overwhelming sensation of dread and fear. He could feel his heart race and his throat getting tight. He worried that he wouldn’t be able to get enough air and would pass out, and only felt better when he got out in the open, away from people Ted tried to avoid going to places where he had panicked before. He avoided crowds and anywhere busy. He took to doing his shopping at night when it was less busy. 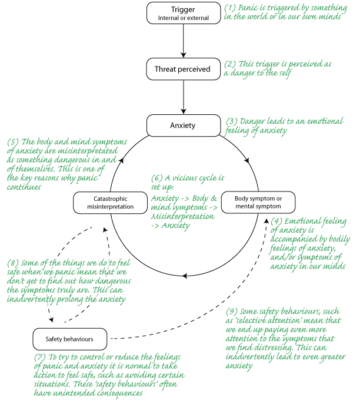 People with panic disorder have sudden and repeated attacks of fear. These attacks are accompanied by strong phy.sical reactions, such as a racing heartbeat, sweating, or shaking, and thoughts that something terrible is happening or will happen. Panic attacks can happen at any time, and people who have experienced a panic attack often dread the possibility of having another one – they often take steps to prevent another one from happening. Some people might just have a one-off panic attack and not experience any more. People who go on to develop panic disorder typically take steps to prevent the possibility of having another panic attack. All animals have a fight or flight response. This is a system built into the body which is designed to keep it safe from danger. This threat system is always on the lookout for dangers in the world around you. If it detects a threat it sets off a cascade of reactions in the body which are designed to increase your chances of surviving the danger. All of this can happen quickly and automatically, before the conscious ‘you’ even has a chance to think about it. The threat systemworksheet below shows all of the key body changes, and describes the good reasons why each of them is designed to happen. OK, so I have a system designed to sense threats. But why is mine going off when I’m not in danger? Our brains are incredibly smart in some ways, but not in others. Brains can respond in the same way to things we think about as they can to things that really happen. For example, think about something you have done that is a bit embarrassing, did you blush a little? Try thinking about your favourite food, did you notice your mouth watering a little bit? In the same way, the threat system can be set off by real dangers in the world around us, but also by things that we think about. Things we know about the threat system? Everyone’s panic attacks are different but psychologists have a good understanding of what happens in a panic attack. The diagram below shows the key stages. 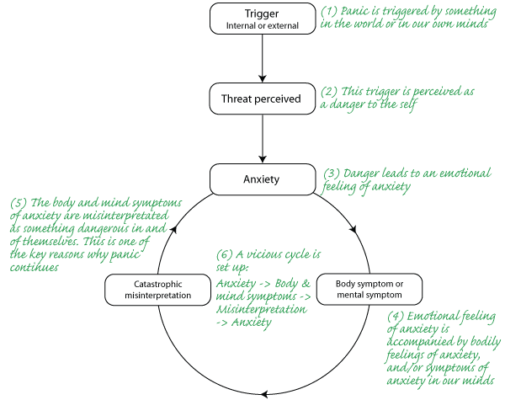 Panic attacks feel horrible – the fear is very intense. Our fight or flight system is designed like this to force us to take action. It is normal to want to avoid having more panic attacks, and there are a number of common-sense ways of trying to do this. Unfortunately these common-sense ways of coping, which psychologists call ‘safety behaviours’, often have the unintended consequence of making future panic attacks more likely. How Can I Overcome My Panic Attacks? You can overcome panic attacks. It often takes work in different stages. You don’t have to do these in order. Interoceptive exposure (exposure to feared body sensations). You need to learn that the sensations of panic are not harmful, and the best way to do this is to bring them on deliberately in a controlled way. This first step is really important – the aim is to become a real expert on your panic attacks. 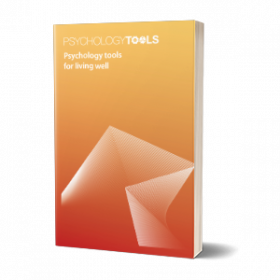 Start by reading our guide Psychology Tools for Overcoming Panic. This goes back to the core message of CBT – change the way you feel by changing the way you think. One way to look at panic is to say that the emotional side of our brain is thinking catastrophic thoughts. Our job is to use the rational side of our brain to balance things out. There are more detailed instructions on how to use thought records on the Thought Records page. The critical part of overcoming panic disorder is to learn how dangerous the body sensations truly are. We can learn this in two ways. One way is to know things in theory, using the rational side of our minds – the first two steps above aim to give you this experience. The other way that human beings know things is emotionally – and the best way to do this is to take actions. The Interoceptive Exposure (literally ‘exposure to body sensations’) worksheets below are designed to take you through a series of exercises which can help you to overcome panic. There are more detailed instructions on how to do these exercises on the Coping With Body Sensations page.